Rodding USA magazine's Issue #5 is sold out but there's still some copies at our dealers retail stores. Check here for a list of locations: http://www.roddingusa.com/index.php/buy/retail-outlets or call Paul Martinez on 520 444 5603. 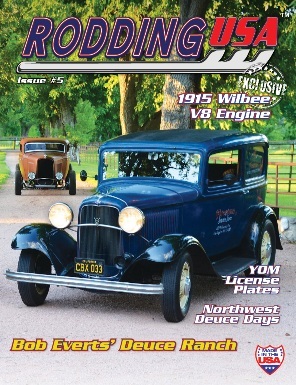 Our fifth edition of Rodding USA magazine features Bob Evert's amazing collection of 1932 Fords. Editor Paul Martinez dubbed it the Deuce Ranch and you'll see why! Also in Issue #5's feature line-up is pinstriper Bill Knight's 1929 Ford pickup, Scott Hawley's 1932 Ford sedan, Randy Green's '23 'Lakes-Style' T roadster, George Michels '55 Nomad and more. Our special interest features are headed by an exclusive expozay on the 1915 Wilbee V8 engine. It's never-before-seen photos will be published for the first time ever in Issue #5 and believe us, it's a fascinating tale of a very unique engine. We go behind the counter at Mooneyes and also lift the door on two hot rod garages to peek inside at what's in-build in our Rodding Digs articles. You won't want to miss our coverage of the North West Deuce Days held in Victoria, Vancouver Island recently, to say it's an amazing event would be an understatement. Oh, and you must catch the super shots taken by Monique Sache at Bonneville's Speedweek, they're works-of-art in their own right and even impressed our own photographic guru Paul Martinez! There's an article on Year-of-Manufacture liscence plates and our event coverage has a first look at NHRA's first-time run Hot Rod Reunion in New England. If you're into doing it yourself then check out our Tech feature on hot rod maths plus our regular features, new products, news from around the industry, hot rod artists and the latest list of hot rod shops stocking the magazine. Issue #5 is sold out but there's still some copies at our dealers retail stores. Check here for a list of locations or call Paul Martinez on 520 444 5603: Rodding USA…by hot rodders, for hot rodders.